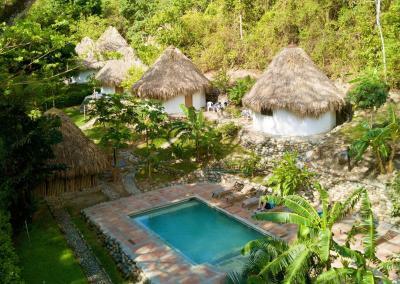 Lock in a great price for Finca Carpe Diem – rated 8.8 by recent guests! It’s surroundings, it’s amenities and its staff. Frankly one of the best places in the Sierra Nevada for adventure travel and relaxing. 3 pools Comfortable Beds Clean Great food Best breakfast! Very lovely & friendly place. 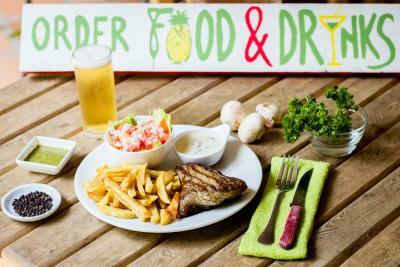 Amazing food, great quality and price. Nice environnement/view and great pools! I loved the beauty of the location and the friendliness of the other guests. 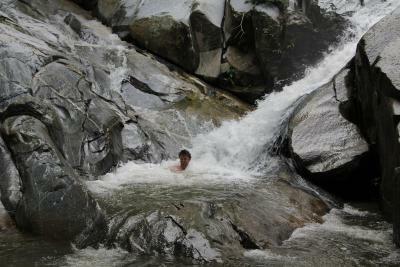 I enjoyed the guided hike to a number of waterfalls which would have been hard to have found on my own. The trip up by motorcycle was an exciting experience. Liked nature,all the trees, swimming pools, service, friendliness of staff and owner, outstanding fruit juices, excellent spaghetti bolognese. I personally loved the relaxed atmosphere! Not only because of the setting in nature, but also because of the structure of the dorms and pools. We watched the most gorgeous starry sky, and enjoyed Jan De Wilde music - being from Belgium, this gave me kind of a homey feeling. Very nice staff, lots of activities to do. And gorgeous view! One of our best sellers in Minca! 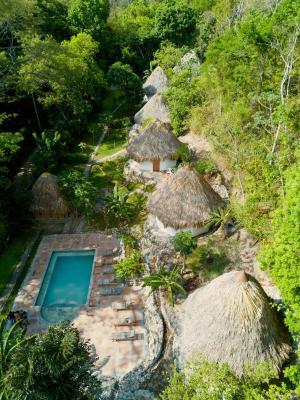 Located alongside a crystalline river and surrounded by the jungle and mountain views, Finca Carpe Diem offers accommodations 11 mi from Santa Marta and 8.7 mi from Tayrona Park.The property is set in Paso del Mango, a tropical valley in the Minca area. Free WiFi access is available in this lodge. 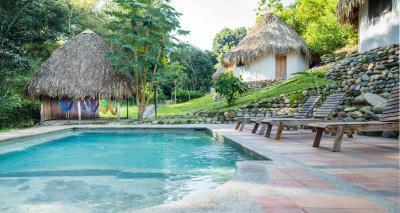 At Finca Carpe Diem you will find 3 outdoor pools and a garden. Other facilities offered include a shared lounge, laundry facilities and a vending machine. 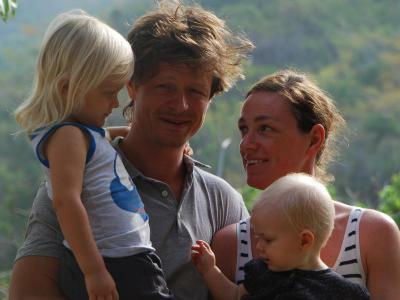 An array of outdoor activities can be enjoyed on site or in the surroundings including swimming, visiting nature reserves, learning how to grow and make your own coffee, honey, cacao and cheese. Manzanares River is located steps from the property. If you feel like visiting the surroundings, check out El Rodadero Beach (8.6 mi) and Quinta de San Pedro Alejandrino (5.7 mi). This lodge is 7.5 mi from Simón Bolivar Airport. 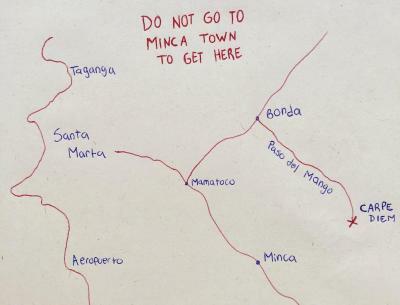 This property is also rated for the best value in Minca! Guests are getting more for their money when compared to other properties in this city. 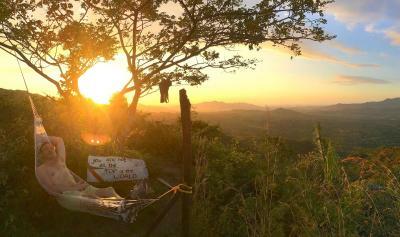 When would you like to stay at Finca Carpe Diem? King suite fitted with a private bathroom with free toiletries and a pool, mountain or garden view. It has a big double bed. This suite has a fireplace and a kitchen. 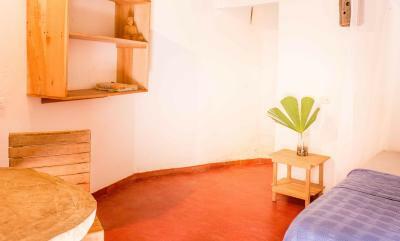 It features a big double bed, a private bathroom with free toiletries and a private terrace with garden view. 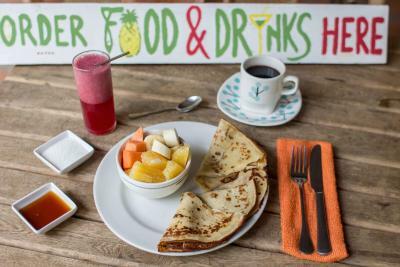 House Rules Finca Carpe Diem takes special requests – add in the next step! Any additional older children or adults are charged COP 30000 per night for extra beds. Finca Carpe Diem accepts these cards and reserves the right to temporarily hold an amount prior to arrival. Take a taxi in Santa Marta going to Bonda (30 min – 10,000 pesos). Ask to get off at the Police Station or footbal field in Bonda. Here you need to go up a small road with a motorbike (15 min - 10.000 cop) to reach Carpe Diem. 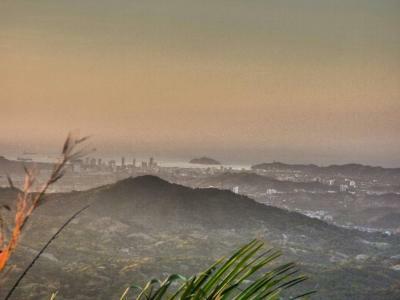 The whole drive is easy to find and takes roughly 50 minutes in total from Santa Marta. You can also do this trip with own transport but you need a 4x4 drive vehicle. We can offer door-to-door services for 120.000 pesos for the whole car from any place in Santa Marta. Take the bus direction Santa Marta. Ask to get off at Veracruz in Bonda (this is a crossing some 20 minutes before entering Santa Marta). Go to the footbal field of Bonda from where you take the mototaxi uphill (15 min - COP 10,000). That my vacation was over and I had to leave it. The new upper area I stayed in was great! - Very small portions, very very Basic breakfast (does not even come with tomatoes or any other vegetable) at least we got a little more of scrambled eggs when we asked for more BETTER Go to the restaurante „la Bonita“, If you leave carpe diem go left and after 50 meters there is a gate on the right. To get to the Restaurante you have to cross the river, its super fun because they offer a funny way of transportation for crossing this river, they will pull you over :-) don’t forget to make a reservation first (ring the Bell), the food is amazing and the owners are super sweet. We always went there for dinner and breakfast! The prices are totally fine. Especially compared to the prices you have to pay in carpe diem. - Electricity blackouts (no candles or any other light) - Bad service (listlessness and disinterest) - Adventurous moto ride to get there, not for the veint hearted. 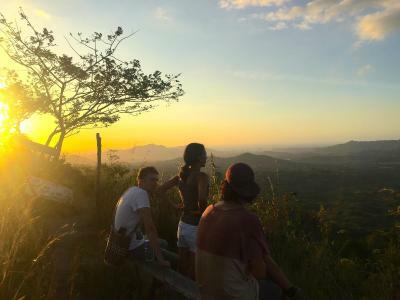 - prices for transportation are super expensive if you don’t want to go by moto (120.000 COP to Bonda) we asked Finca Bonita and they offered us a very good price! Kitchen could be better equipped with new pods and sharp knifes. Very beautiful place! The food is good. We did a nice tour to the waterfalls. There was an ant colony living in our bed frame. I expected to encounter bugs, but that was a lot to deal with. They ran out of filtered water on the first day and never got more, so we were forced to buy bottles at an upcharge. The volunteers who run the hostal weren't very friendly or helpful. There's a very comprehensive guide/activity book written by the owners, but if you have questions beyond what's in the book, the volunteers aren't willing to help you, even little things like asking for clearer directions on a walk / hike. Maybe it's just this crop of volunteers, but they all seemed passive and shy. If you come here, do your research before to plan out your days because there isn't much help once you're here. And read the guidebook very carefully before going on a hike. I doubt anyone would have noticed if we went missing here. The locals though were incredibly friendly. This comment is about the volunteer-tourists only. The location and facilities are gorgeous. 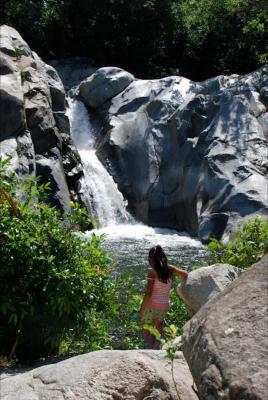 This is such a tranquil place with lots of natural things to do around - hiking, waterfalls, farm tours, great vistas on the property. Common areas were clean and well-thought-out. It's out of the way and tricky to get to, but the hostal gives you lots of information well before your stay to ensure you get here safely and effectively. The food in the restaurant is a bit more expensive for a backacker budget (around 21000COLpesos per meal). The beds in the dormitories stand free and you might get scared falling out of the bed sleeping in the upper bed (no frame). 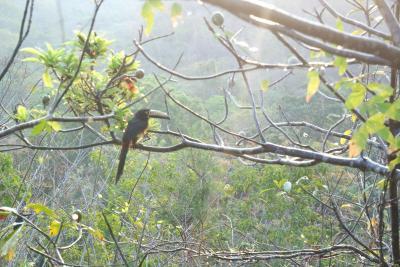 The Hostel is surrounded by beautiful nature and is THE place to relax. The staff is very helpful and friendly. There is a bunch of things to do in that area and you don't even have to book a tour. Take a bottle of water with you and go exploring. 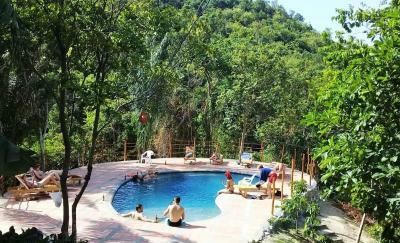 All of the 3 pools are very clean and two of them give you a crazy beautiful view over the surrounding hills. 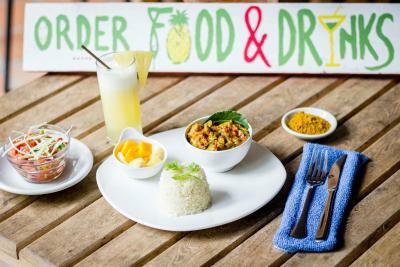 The food in the restaurant is very delicous! The hostel offers free drinking water. Bathrooms get cleaned every day. Every bed in the dormitories has a mosquito net. Very basic, damp room, and the shower was just a spout with cold water. Other than the pools, the facilities are very basic. It’s advertised as a mango/cheese farm but we saw no evidence of that - and overall just slightly disappointed in the reality vs how it appears on this website. We did two activities during our stay - a trip to Tayrona, which was doable but involved a 3 hour round trip to the park entrance; and bee-keeping, which was a bit disappointing as we were just given a sheet of paper explaining what bees are in English, and then the guides just showed us a bee hive (it also involved a very tricky walk up to the hives). Don’t underestimate how hard it is to get to Carpe Diem - it’s a good 25 minute motorbike ride from Bonda on a very bumpy mountain track. 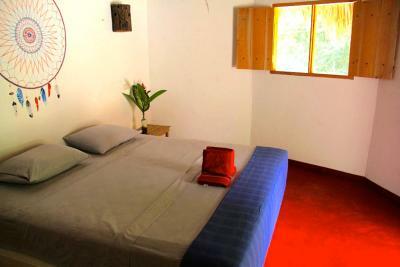 The hostel offers 4x4 transfers to/from Minca/Santa Marta etc but these are very expensive. Very nice pool areas, decent enough restaurant for all meals, air con in our room, and lots of small things to do around/at the hostel. Nice to experience a more quiet area than Minca. Good food. Beatiful scenery from the pool area.